OMT is an individually customised program, that incorporates specific activities and exercises to help eliminate many of the causes of swallowing abnormalities and improper rest posture of the tongue. Orofacial Myofunctional Therapy is painless and the exercises are relatively simple. When certain muscles of the face are activated and functioning properly, other muscles will follow suit until proper coordination of the tongue and facial muscles is achieved. To have success in this therapy, consistent exercise every day is necessary until the existing, improper muscle pattern has been corrected. It also takes commitment by the patient, family – and time. Treatment usually begins with a comprehensive evaluation, followed by an intensive 8 week program with our Myofunctional Therapist. Following that – a regular program of exercises and reviews over a 6 – 12 month period. Treatment length may vary. Why would I need to see a Myofunctional Therapist? Orofacial Myofunctional Therapists are trained to treat people who have Orofacial Myofunctional Disorders (OMDs). 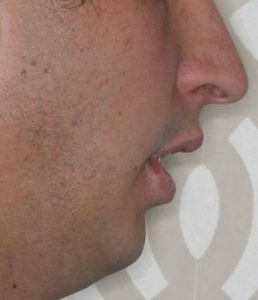 Most OMDs originate with inadequate habitual nose breathing, or with chronic mouth breathing. The subsequent adaptation of the facial muscles and functions from this disordered breathing habit, will create many Myofunctional Disorders. The goal of our Orofacial Myofunctional Therapist is to provide customised treatment for you or your child while working with the recommended treatment plan of your dentist, orthodontist or speech pathologist to collectively achieve the best oral function and balance. How can a Myofunctional Disorder impact swallowing? A person usually swallows 500-1000 times each day. The act of swallowing is one function that depends on our muscles working in a balanced manner. To swallow properly, muscles and nerves in the tongue, cheeks and throat must work together in harmony. Correct swallowing depends on a proper relationship between muscles of the face, mouth and throat. When a person swallows normally, the tip of the tongue presses firmly against the roof of the mouth or hard palate, located slightly behind the front teeth. The tongue acts in unison with all the other muscles involved in swallowing. The hard palate, meanwhile, absorbs the force created by the tongue. Although improper swallowing causes a variety of problems, it is the resting position of the tongue that does the most damage, because it is more constant. Hence, to correct an improper swallow, the tongue needs to be taught where it’s correct resting position is. This is a vital part of any Myofunctional Therapy program. 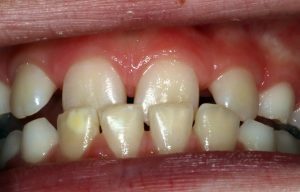 How does a Myofunctional Disorder change the way our teeth grow? When a person swallows incorrectly, the tip and/or sides of the tongue press against, or spread between the teeth. This is commonly called a tongue thrust. Constant pressure from a low resting tongue, or incorrectly thrusting the tongue away from the roof of the mouth may push teeth out of place. That pressure may later prevent teeth from erupting into their correct position in the jaws. The constant pressure of the tongue against or between the teeth will not allow the teeth to bite together. This is known as an open bite. Thumb, finger or dummy sucking habits force the tongue into a low position that pushes it against the teeth. 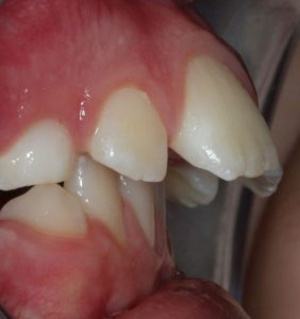 This horizontal protrusion of the upper teeth in front of the lower teeth is known as an overjet. This can greatly affect a person’s appearance and confidence. A Myofunctional Disorder can lead to an abnormal bite or malocclusion. 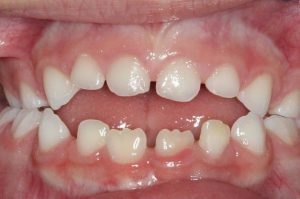 This occurs when the alignment between the upper and lower teeth is improper, causing them not to ‘fit together’ correctly. Malocclusion may appear as crooked, crowded, or protruding teeth. This problem may lead to difficulties in biting, chewing, swallowing, and digesting food. It may also affect a person’s appearance and speech. An improper alignment or malocclusion between the upper and lower teeth can lead to difficulties in biting and chewing food. How can I tell if I have a Myofunctional Disorder? Often the most obvious symptom of incorrect oral posture involves the muscles of the face. A dull, lethargic appearance and full, weak lips develop when muscles are not operating normally. Constantly parted lips (with or without mouth breathing) is another indicator of this disorder. Mouth breathing or constantly open lips is a cause and/or signal of tongue thrust and low tongue rest posture. Does Myofunctional Therapy help to improve speech? A person with abnormal oral muscle patterns may suffer a lisp or have difficulty in articulating sounds. If muscles in the tongue and lips are incorrectly postured, this can prevent a person from forming normal speech sounds. A Myofunctional Therapist will help to balance orofacial muscles, however a Speech Therapist must be sought for correct enunciation of sounds. What are some of the other issues that Myofunctional Therapy can help resolve? Improper oral muscle function may, in addition, lead to TMJ dysfunction, headaches, stomach pain/bloating (from swallowing air), airway obstruction, and sleep disordered breathing. Recent research has shown that Myofunctional Therapy may reduce the symptoms of sleep disordered breathing (such as snoring) and improve mild to moderate obstructive sleep apnoea (OSA). When the muscles of the tongue, throat and face are functioning and used correctly, this assists in the resolution of many of these disorders. A properly trained Myofunctional Therapist is one member of the team that will successfully treat an OMD. Other allied professionals such as Dentists, Orthodontists, ENT’s, Sleep Physicians, GP’s, Chiropractors, Osteopaths and Speech Therapists, will work collaboratively to ensure that the patient’s needs are addressed and handled appropriately. We feel that the patient needs to be looked at from a variety of approaches to be successful in treatment. At Enhance Dentistry, we believe that everyone deserves to be educated about Myofunctional Disorders and treated if they suffer from them. With Myofunctional Therapy, a patient can regain the enjoyment of eating, speaking, breathing and even sleeping more soundly. Further to this, cosmetic improvements can help restore confidence and self-esteem.